Photo by Karen Salkin, as is the one at the top of the page. 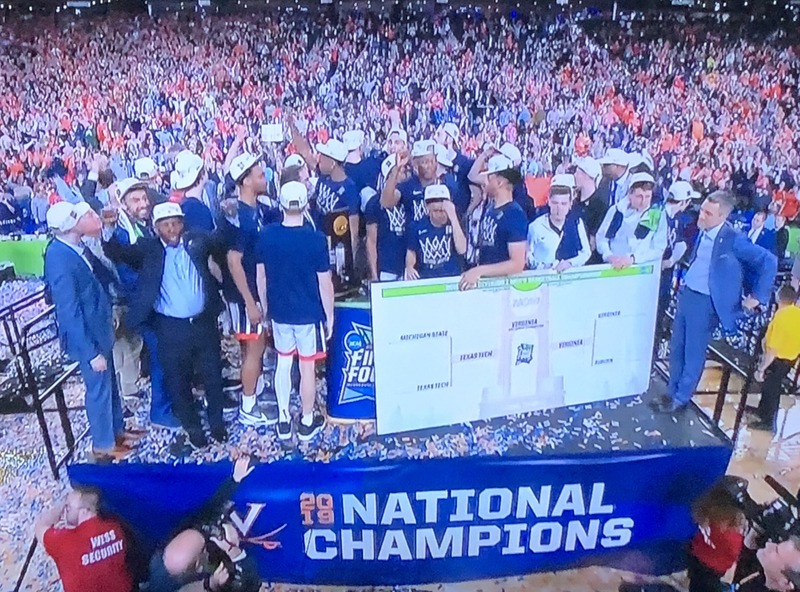 Major congratulations to the 2019 NCAA Basketball Champions, Virginia! What a story they are. On Twitter, I hailed them as “#WorstToFirst”! 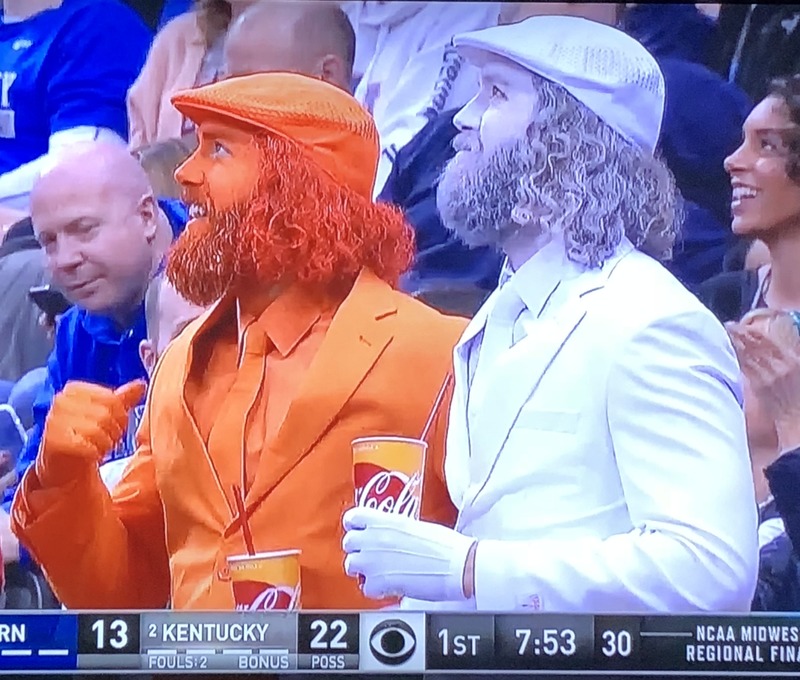 If you’re not a sports fan, and are curious as to what that means, here’s the quick story: Last year, when they were also a #1 seed, (as they were this year, as well,) they were the first #1 to ever lose to a #16 in the March Madness tournament, which is, of course, considered a disgrace. And to book-end those experiences like this is truly an incredible story. 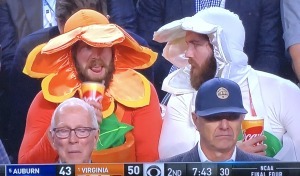 Virginia was not my team all along, but I’m so happy to have witnessed their historic journey. 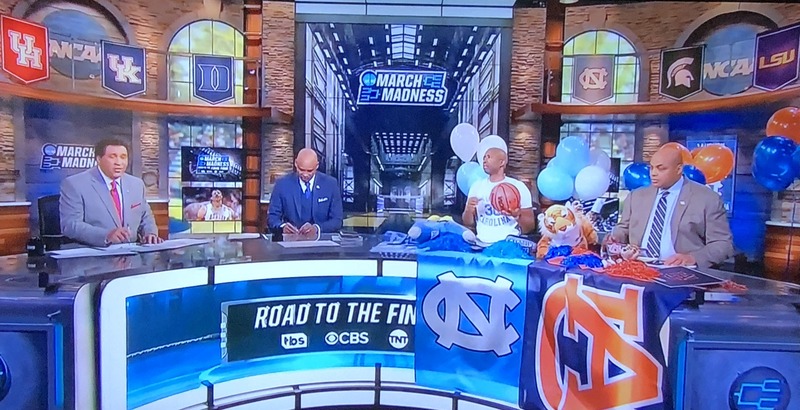 I still feel awful for Charles Barkley to have suffered through his beloved Auburn’s loss to Virginia in that final play in the Final Four, but at least he finally correctly predicted who the Champions would be from the get-go! I doubt that many people had Virginia as the winner in their official March Madness brackets, so I’m happy for him to have done that. 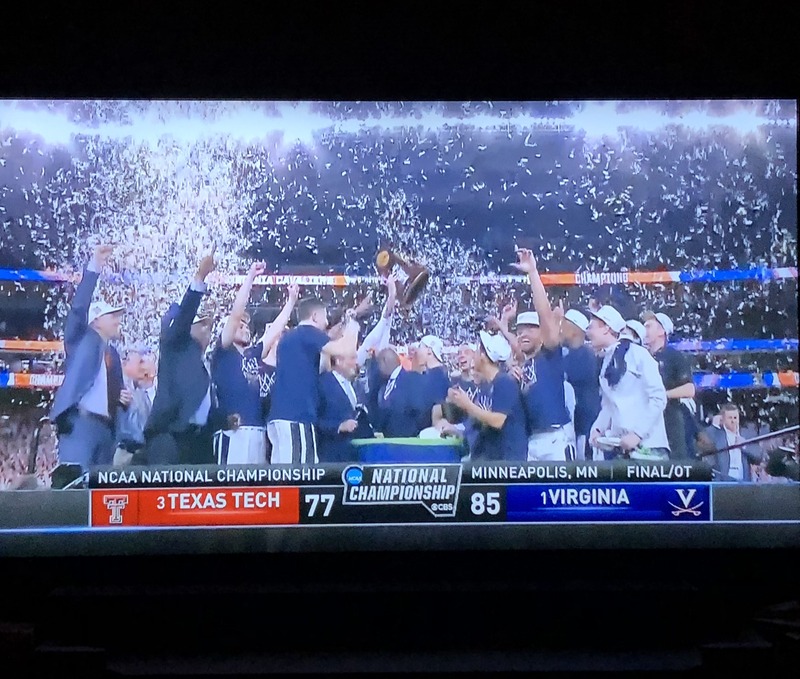 This was the first all-time meeting between Virginia and runner-up Texas Tech. Ever—not just in this tournament! That was pretty interesting. 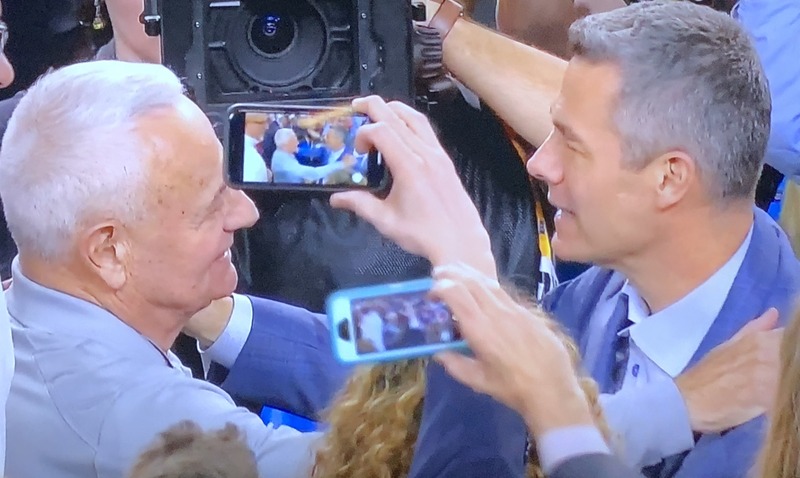 Victorious Viginia coach, Tony Bennett, on the right, being congratulated by his dad, a former college coach, after the win. Photo by Karen Salkin. Virginia’s main man, Tony Bennett, is the coolest calmest college coach ever! I’ve never seen him yell or reprimand. In times-out during the game, Coach Tony Bennett asked his players what plays they wanted to run! What a gem of a game—it was thrilling. I couldn’t stop biting my fake nails!!! We will never see this exact scenario again because no other team will be the first #1 to ever lose to a #16. 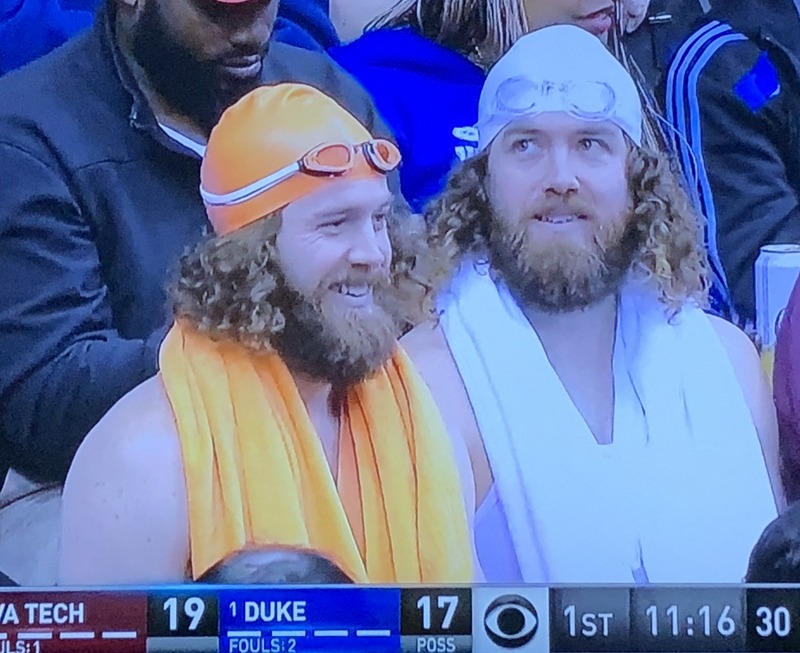 I feel bad for Texas Tech to have lost because they were mostly seniors. Twin lunatic fans who showed-up in different orange-and-white outfits to many games! Photo by Karen Salkin. Both games tonight were embarrassingly low-scoring ones. And another set of their wacky outifts! Photo by Karen Salkin. Of the Sweet 16, only two unexpected seeds were there—#5 Auburn and #12 Oregon. There are usually so many more upsets at this point. 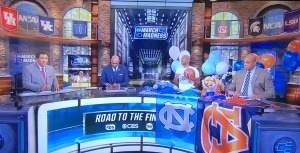 I guess the Selection Committee did a really good job this year! And yet another one! Photo by Karen Salkin. I was shocked to see how cold and tired losing Michigan head coach John Beileine’s handshake to winning Texas Tech head coach Chris Beard was! 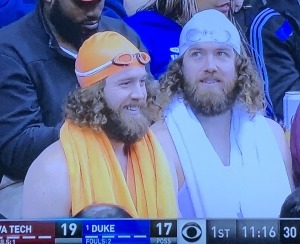 I thought he was a better sport than that. Speaking of Chris Beard, he told his team, “Enjoy the ride, not just the destination.” That’s always been my philosophy! The UNC players going over to show support for their injured opponent, Auburn’s Chuma Okeke, after his horrific knee injury. Photo by Karen Salkin. 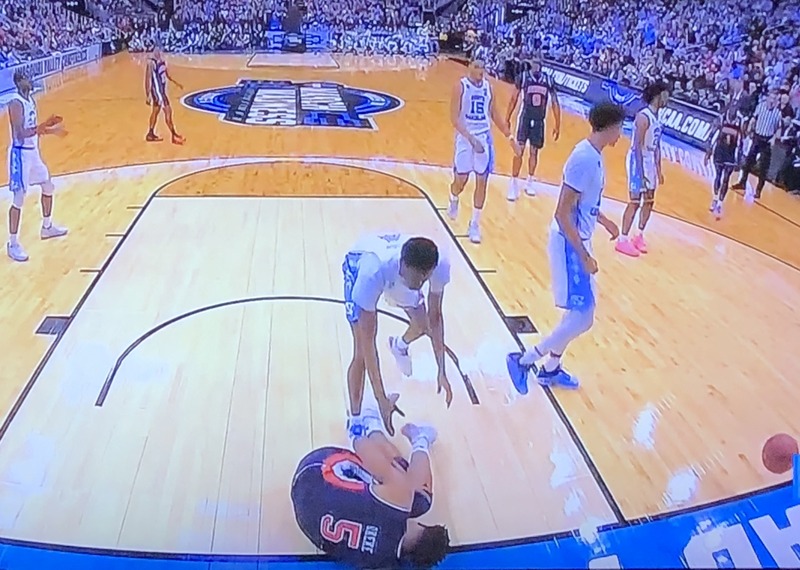 I have rarely seen such a display of sportsmanship as I have with this incident: Auburn’s best player, Chuma Okeke, went down with a horrific knee injury, caused by no one. It was just a fluke. 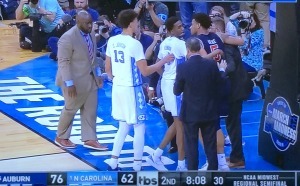 And so many of his opponents, the players from UNC, went over to hug him. I’ve honestly never seen that before. Good for them. Kyle Guy, of eventual Champions Virginia, is the first person I’ve ever heard in this tournament posit that it might not go their way, and that will be okay. He said, “I think, you know, we can go as far as we want to go. And if the outcome isn’t what we want, we know we’re going to leave it all on the floor, and that’s what matters.” I love that! Bryce Brown from Auburn is sincerely a polite kid. I’m impressed by that. The CBS analyst panel: (L-R) Greg Gumbel, Clark Kellogg, Kenny Smith, and Charles Barkeley. Photo by Karen Salkin. 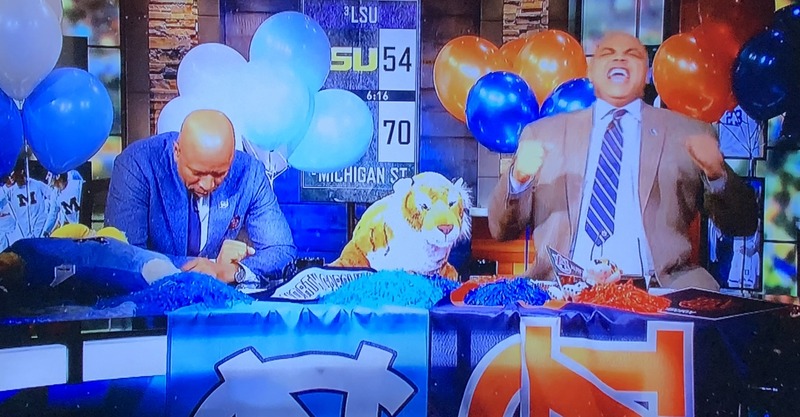 Clark Kellogg is the perfect guy on the TV analysts’ panel; he explains everything well, and is a warm intermediary between Charles Barkley and Kenny Smith, who can both get out of control on occasion. I’m so upset about the last minute of the Gonzaga-Texas Tech game. The officials didn’t notice a major error—Tech player Tariq Owens totally stepped out of bounds, with his entire foot, which deprived the Zags of a possible three points, and at the same time, gave the Techs an extra point! The outcome might have gone the other way if the refs had gotten it right. Chuma Okeke on the floor when he injured his ACL, writhing in pain. Photo by Karen Salkin. Thank goodness Auburn’s best player, Chuma Okeke, came to the arena for the second half, not even for the team, but for me! He’s the guy who tore his ACL in the game two days earlier, and was therefore in a wheelchair. He had chosen to hang back in the hotel, a decision I was feeling awful about! I knew he’d feel best being there with the guys, and they him. And they won, once he showed-up! Michigan State‘s best player, Cassius Winston, is an adorable person! He told a story about thinking that there was literal magic in his athletic headbands when he was little! And he said now it’s 50-50! So adorbs. A good look at an earlier example of “the thrill of victory,” (the guys in blue,) and “the agony of defeat,” (the guys in white.) Photo by Karen Salkin. 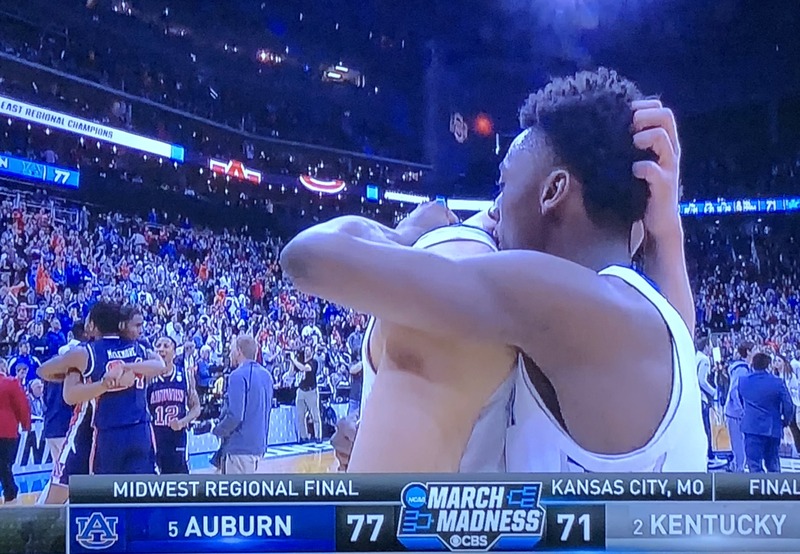 Okay, this one makes me too sick to even write about, so, if you really don’t know what happened at the end of Auburn’s loss to Virginia, look up the deets for yourselves. But I can honestly tell you, Virginia won after the last second! I’m still sick over it. And then in the next game, Texas Tech’s big guy, Tariq Owens, turned his ankle so badly, it was scary. And because his legs looks skinnier than Gumby’s, his knee turned, too. It was all horrible. He limped off, but came running back out to play a few minutes later!!! Who does that??? I turned my ankle like that a few years ago, when I was just power-walking. Not only did I have to wear an orthopedic boot for months, but it led to me having a herniated disc, and then a broken back! I guess that athletes are just a different breed. The final March Madness bracket for 2019! That’s all, folks! Photo by Karen Salkin.